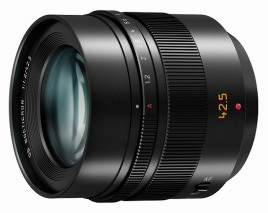 Panasonic will soon announce a new Leica DG NOCTICRON 42.5mm f/1.2 ASPH POWER OIS lens. Update: the price of the lens will be $1,599.00. Panasonic is proud to introduce the new LEICA DG NOCTICRON 42.5mm / F1.2 ASPH. / POWER O.I.S. (H-NS043)interchangeable lens for the LUMIX G based on the Micro Four Thirds System standard. (35 mm camera equivalent: 85 mm). This incredible lens not only has a maximum aperture of F1.2, but it also incorporates optical image stabilization (POWER O.I.S.) along with full time Auto Focus. Certified by the world-renowned LEICA, exceptional high image quality is guaranteed as well as its sophisticated metal design. The name "NOCTICRON" was newly defined by Leica Camera AG for this lens that achieves a remarkably fast F1.2 aperture among Micro Four Thirds digital interchangeable lenses. The new lens system is comprised of 14 elements in 11 groups and uses two aspherical lenses, one ED (Extra-low Dispersion) and one UHR (Ultra High Refractive Index) lens. The aspherical lenses suppress spherical aberration and distortion. The ED lens enables sharp, high contrast description without color bleeding to the corners while the UHR lens enables high optical performance that renders an image with uniformed descriptiveness from center to edges as well as downsizing of the lens unit. The popular 42.5 mm medium-telephoto focal distance (Equivalent to 85 mm on a 35 mm camera) is perfectly suited for portraits with rich stereoscopic effect. Together with the high-speed aperture, users can utilize the beautiful soft focus for more impressive, creative shots. Nine blades give the aperture a rounded shape that produces an attractively smooth effect in out-of-focus areas when shooting at larger aperture settings. It also captures landscape with an extremely natural perspective. In addition, the aperture ring on the lens barrel allows direct, intuitive control over aperture settings. Panasonic's Nano Surface Coating technology has been adopted to the NOCTICRON 42.5mm / F1.2 ASPH. / POWER O.I.S. Reflection is dramatically minimized at entire visual light range (380nm-780nm) by applying the extra-low refractive index coating with nano-sized structure on the surface of the lens. It results in a super clear image with dramatic reduction of ghost and flare. Due to the shallow depth of field which is unique to the large aperture lens, even a slight handshake can potentially cause images to be out-of-focus. However, the POWER O.I.S. (Optical Image Stabilizer) which is integrated in the LEICA DG NOCTICRON 42.5mm effectively compensates for not only small, fast movement but also large, slow movement, making it easy to capture super clear shots even when shooting in low-lit situations such as in night time or indoors. It incorporates superior inner focus system, which enables excellent resolution and contrast from close-up to infinity. The inclusion of newly developed stepping motor makes the focusing action smooth and silent for use in both still and video recording. Notably the performance of Auto Focus is far superior to the phase-difference AF when a fast lens with smaller F value is used. When mounted on LUMIX G cameras, users can take advantage of the high-speed, high-precision Contrast AF system. The sophisticated metal design of LEICA DG NOCTICRON 42.5mm / F1.2 ASPH. / POWER O.I.S., including the hood, deserves to bear the prestigious LEICA name. A highly reliable metal mount is durable enough for repeated mounting of the lens. This entry was posted in Panasonic and tagged CES 2014. Bookmark the permalink. Trackbacks are closed, but you can post a comment.